A baby wren ponders the risk of leaving home. Her first 8 days were spent in an odd spot -- my garage, where six shetland sheepdogs sleep within an enclosure that has a flap-door outside. The bird's parents gained a risky access through the narrow flap of the dog door and built a nest on a shelf between two paint cans. 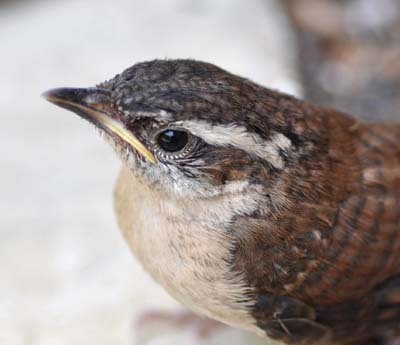 I found the wren family one morning when a small bird appeared inside my house, scuttling under furniture and around corners like a brown mouse. She was caught and released, and I soon located her nest, made from sticks, grass and pine-needles laboriously shuttled from outside. The wrens had also incorporated soft, downy fur from the shedding dogs. The ejected wren promptly re-entered through the dog door carrying an insect in her beak -- food for her clutch of four hungry babies. I got the warning "Cack Cack" call that indicates danger, but the wren was familiar enough by now to tolerate my presence. For a week I fretted over the chicks' escape. Finally I opened my garage door and watched the fledglings chirp and flutter weakly while the parents perched outside and tried to lure them out them with musical calls that carried a slight hint of anxiety. This picture shows one chick sitting on the edge of the garage, getting a first look at grass and trees. Will the tiny bird have the courage to leave? The bird is fully alert, but docile -- confused by the new sights and sounds outside the cozy artificial clutter of my garage -- perched on the edge of a beautiful new world that has been increasingly squeezed by humans. One chick hid under a pile of lumber -- its plaintive cries growing weaker until they finally went silent. But the bird pictured here made a different choice. Seconds after I took this photo, the chick took her first flight -- following her parents into the forest.